Full Service Yarn Shop: Where did everybody go? The shop has been incredibly slow this week. Things were riproaring along until about Monday then it turned into Deadly Deadola of Deadsville in here. It is finally cool enough to wear wool socks. 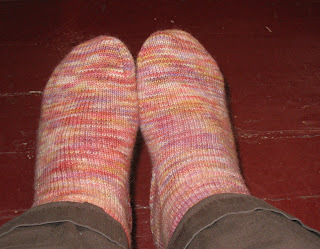 These are out of Arucania Ranco and were finished so late in the spring that I didn't get to wear them. My other consolation, I'm getting a lot of work done on my bookkeeping...whoopee.